Note to the gullible: Most of what's below is made up. The quote from Curt's article is legit, but the rest is made up. The Indy Racing League Tuesday put Venezuelan Rookie Milka Duno on double-secret probation and sentenced her to attend backmarker school. The Indy Racing League has put rookie driver Milka Duno on probation, forcing her to hone her skills elsewhere if she is to continue with the series. According to chief steward Brian Barnhart, probation means that "virtually everything she does will be scrutinized, with no mistakes (allowed)." Barnhart instructed SAMAX Motorsport officials to have Duno begin testing with IRL veteran Tomas Enge to improve her skills racing with other cars. Duno will not compete in Saturday night's race at Kentucky Speedway. A source inside the league said Tuesday that Duno will be sent to "Backmarker School" to "learn how to be lapped and blown by in the proper fashion." The source said the league set up the school to teach otherwise talented drivers how to participate in the league with cars that haven't a shot in hell at winning. Advanced euphemisms for "my car is a f*cking pig." In this course, drivers are put into light-blue, un-decaled 1979 Ford Fairmonts and mercilessly lapped by rich kids in 2007 Mustang GTs covered in sponsor logos. Then they are taken to mock media interviews and taught to say things like, "We're still looking for speed" when they really want to scream, "My car is a goddamn pig that travels at half the speed of smell." How to get out of the way of drivers of real cars without causing The Big One. Sources said Duno will especially concentrate on this one, which teaches the fine art of "staying flat" even when lead-lap cars come by you at 5 to 12 mph faster than your lifetime best speed. "You really have to brace yourself to be inhaled like that in an Indy car or you could take someone who has a shot at winning out of the race. And that would make ESPN/ABC pretty pissed off." Secrets to Staying Sane when God Himself Couldn't Win with Your Car. This course focuses on how to accept that you're driving for 12th every race and not go crazier than Jack Arute on League Karoke Night. How to Handle Being Totally Unrecognized by Fans. Focuses on graceful ways to answer "Are you sure you're really a driver? "or "Can you get me Danica's autograph?" "We discovered a few years ago, with the rise of the Big Three, and the total dearth of sponsors to go around, that we needed a training program that helped good drivers come to grips with the fact that their cars, no matter how you dress them up, were complete pigs," said another IRL insider. "It's been going pretty well so far. You can tell by how courteously the lapped traffic gets out of the way of the seven to ten cars with a chance to win every race. We're pretty proud of that." If Milka gets passing grades at Backmarker School, the league will gladly give her eight to 12 more chances to participate in races. "Let's face it, car count is car count," said a league official. "And that Citgo money spends as well as any. So if we can keep Milka in the mix, I don't see a loser." 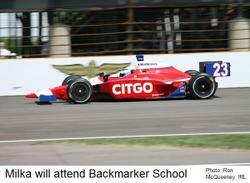 I'm curious who the instructors are at backmarker school. Raul Boesel? Marco Greco? Billy Roe? I hereby request that you and My Name is IRL drop "Milkalicious" and now refer to her as "Milka Deadlast"